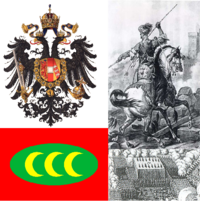 The Ottoman-Habsburg wars refers to the military conflicts between the Ottoman Empire and the Habsburg dynasties of the Austrian Empire, Habsburg Spain, and in certain times, the Holy Roman Empire and the Kingdom of Hungary. The war would be dominated by land campaigns in Hungary. Initially, Ottoman conquests in Europe proved successful with a decisive victory at Mohacs reducing the Kingdom of Hungary to the status of an Ottoman tributary. By the sixteenth century, the Ottomans had become an existential threat to Europe, with Ottoman Barbary ships sweeping away Venetian possessions in the Aegean and Ionia. When, on several occasions, the Ottomans reached the gates of Vienna, considered a cultural capital of Europe, it seemed that the devil himself was threatening the very survival of Europe and of its dominant religion. The Protestant Reformation, the France-Habsburg rivalry, and the numerous civil conflicts of the Holy Roman Empire served as distractions. Meanwhile the Ottomans had to contend with the Persian Shah and the Mameluke Sultanate, both of whom were defeated and the latter fully annexed into the empire. In the seventeenth and eighteenth centuries, the Peace of Westphalia and the War of the Spanish Succession respectively reduced the House of Habsburg to the Austrian Empire. By then, however, European advances in guns and military tactics outweighed the skill and resources of the Ottomans and their elite Janissaries, thus ensuring Habsburg dominance on land. The Great Turkish War ended with three decisive Holy League victories at Vienna, Mohacs and Zenta. The wars came to an end when the Austrian Empire and the Ottoman Empire signed an alliance with the German Empire prior to World War I. Following their defeat in that war, both Empires were dissolved. The centuries of conflict between the Ottomans and Europe has often been characterized as a civilizational clash as well as one between rival religions. The fact that epochal battles took place between the Ottomans and Habsburg is a fact of history. Yet throughout this period there were also incidents of more fruitful exchange, so in remembering the epochal battles, the fact that relations on the ground were sometimes more cordial must not be forgotten. The origins of the wars are clouded by the fact that although the Habsburgs were occasionally the Kings of Hungary and Germany (though almost always that of Germany after the fifteenth century), the wars between the Hungarians and the Ottomans included other Dynasties as well. Naturally, the Ottoman Wars in Europe attracted support from the West, where the advancing and powerful Islamic state was seen as a threat to Christendom in Europe. The Crusades of Nicopolis and of Varna marked the most determined attempts by Europe to halt the Turkic advance into Central Europe and the Balkans. The confrontations always had a religious hue; the Ottomans saw territorial expansion as a duty, to extent God's rule. Christians saw the Muslims as infidel; Europeans also characterized the Turks as uncivilized. For a while the Ottomans were too busy trying to put down Balkan rebels such as Vlad Dracula. However, the defeat of these and other rebellious vassal states opened up Central Europe to Ottoman invasion. The Kingdom of Hungary now bordered the Ottoman Empire and its vassals. 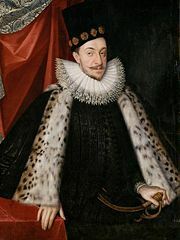 After King Louis II of Hungary was killed at the Battle of Mohacs, his widow Queen Mary fled to her brother the Archduke of Austria, Ferdinand I. Ferdinand's claim to the throne of Hungary was further strengthened by the fact that he had married Anne, the sister of King Louis II and the only family member claimant to the throne of the shattered Kingdom. Consequently Ferdinand I was elected King of Bohemia and at the Diet of Bratislava he and his wife were elected King and Queen of Hungary. This clashed with the Turkish objective of placing the puppet John Szapolyai on the throne, thus setting the stage for a conflict between the two powers. Ferdinand I attacked Hungary, a state severely weakened by civil conflict, in 1527, in an attempt to drive out John Szapolyai and enforce his authority there. John was unable to prevent Ferdinand's campaigning which saw the capture of Buda and several other key settlements along the Danube. Despite this, the Ottoman Sultan was slow to react and only came to the aid of his vassal when he launched a huge army of about 120,000 men on May 10, 1529. At Vienna, the Ottomans found overrunning pike formations in the face concentrated musket fire a challenge too difficult to overcome. 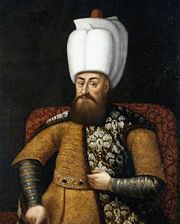 The Ottoman Sultan, Suleiman the Magnificent, easily wrestled from Ferdinand most of the gains he had achieved in the previous two years—to the disappointment of Ferdinand I, only the fortress of Bratislava resisted. Considering the size of Suleiman's army and the devastation wrought upon Hungary in the previous few years it is not surprising that the will to resist one of the world's powerful states was lacking in many of the recently garrisoned Habsburg settlements. The Sultan arrived at Vienna on September 27, the same year. Ferdinand's army was some 16,000 strong—he was outnumbered roughly 7 to 1 and the walls of Vienna were an invitation to Ottoman cannon (6ft thick along some parts). Nonetheless, Ferdinand defended Vienna with great vigor. By October 12, after much mining and counter-mining an Ottoman war council was called and on October 14 the Ottomans abandoned the siege. The retreat of the Ottoman army was hampered by the brave resistance of Bratislava which once more bombarded the Ottomans. Early snowfall made matters worse and it would be another three years before Suleiman could campaign in Hungary. Martin Luther wrote his tract On War Against the Turks in 1529 as a response to the Siege of Vienna. He described Islam as a "patchwork of Jewish, Christian, and heathen beliefs," and saw the work of the devil behind this. The Turks, however, were God's scourge on European unbelief, "God's rod and the devil's servant." Before fighting the Turks, repentance was a prerequisite. After the defeat at Vienna, the Ottoman Sultan had to turn his attention to other parts of his impressive domain. Taking advantage of this absence, Archduke Ferdinand launched an offensive in 1530, recapturing Gran and other forts. An assault on Buda was only thwarted by the presence of Ottoman Turkish soldiers. Much like the previous Austrian offensive, the return of the Ottomans forced the Habsburgs in Austria to go on the defensive once more. In 1532 Suleiman sent a massive Ottoman army to take Vienna. However, the army took a different route to Koszeg. After a heroic defense by a mere 700-strong Austrian force, the defenders accepted an "honorable" surrender of the fortress in return for their safety. After this, the Sultan withdrew content with his success and recognizing the limited Austrian gains in Hungary, whilst at the same time forcing Ferdinand to recognize John Szapolyai as King of Hungary. Whilst the peace between the Austrians and the Ottomans would last for nine years, John Szapolyai and Ferdinand found it convenient to continue skirmishes along their respective borders. In 1537 Ferdinand broke the peace treaty by sending his ablest generals to a disastrous siege of Osijek which saw another Ottoman triumph. Even so, by the Treaty of Nagyvárad, Ferdinand was recognized as the heir of the Kingdom of Hungary. The death of John Szapolyai in 1540 saw Ferdinand's inheritance robbed; it was instead given to John's son John II Sigismund. Attempting to enforce the treaty, the Austrians advanced on Buda where they experienced another defeat by Suleiman; the elderly Austrian General Rogendorf proved to be incompetent. Suleiman then finished off the remaining Austrian troops and proceeded to de facto annex Hungary. By the time a peace treaty was enforced in 1551, Habsburg Hungary had been reduced to little more than border land. However, at Eger the Austrians achieved a stunning victory, thanks in part to the efforts of the civilians present. After the seizure of Buda by the Turks in 1541, the West and North Hungary recognized a Habsburg as king ("Royal Hungary"), while the central and southern counties were occupied by the Sultan ("Ottoman Hungary") and the east became the Principality of Transylvania. The Little war saw wasted opportunities on both sides; Austrian attempts to increase their influence in Hungary were just as unsuccessful as the Ottoman drives to Vienna. Nonetheless, there were no illusions as to the status quo; the Ottoman Empire was still a very powerful and dangerous threat. Even so, the Austrians would go on the offensive again, their generals building a bloody reputation for so much loss of life. Costly battles like those fought at Buda and Osijek were to be avoided, but not absent in the upcoming conflicts. In any case Habsburg interests were split 3-way between fighting for a devastated European land under Islamic control, trying to stop the gradual decentralization of Imperial authority in Germany, and Spain's ambitions in North Africa, the Low Countries and against the French. Having said this, the Ottomans, whilst hanging on to their supreme power, could not expand upon it as much as they did in the days of Mehmet and Bayezid. Whilst the nadir of the Empire had yet to come, its stagnation would be characterized by the same campaigning that led to little real expansion. To the east lay further wars against their Shi'ite opponents, the Safavids. Suleiman the Magnificent led one last final campaign in 1566 against "the infidels" at the Siege of Szigetvar. The Siege was meant to be only a temporary stop before taking on Vienna. However, the fortress withstood against the Sultan's armies. Eventually the Sultan, already an old man at 72 years (ironically campaigning to restore his health), died. The Royal Physician was strangled to prevent news from reaching the troops and the unaware Ottomans took the fort, ending the campaign shortly afterward without making a move against Vienna. Meanwhile, the Ottoman Empire rapidly began displacing her Christian opponents at Sea. In the fourteenth century, the Ottomans had only a small navy. By the fifteenth century, hundreds of ships were in the Ottoman arsenal taking on Constantinople and challenging the naval powers of the Italian Republics of Venice and Genoa. In 1480, the Ottomans unsuccessfully laid siege to Rhodes Island, the stronghold of the Knights of St. John. When the Ottomans returned in 1522, they were more successful and the Christian powers lost a crucial naval base. In retaliation, Charles V led a massive Holy League of 60,000 soldiers against the Ottoman supported city of Tunis. (Formed with Papacy blessing and at the pope's request, the Holy Leagues were combined Christian forces from across Europe.) Mulei Hassan, who had lost Tunis to Hayreddin Barbarossa in 1534 appealed to Charles for help. Charles sent a fleet, put 30,000 of the city's residents to the sword and restored the Muslim Hassan to the throne but as a Spanish vassal. The campaign was not an unmitigated success; many Holy League soldiers succumbed to dysentery, only natural for such a large overseas army. Barbarossa had fled Tunis well before the fleet arrived and won a victory against the Holy League in 1538 at the Battle of Preveza. Despite the loss of Rhodes, Cyprus, an island further from Europe than Rhodes, remained Venetian. When the Knights of St. John moved to Malta, the Ottomans found that their victory at Rhodes only displaced the problem; Ottoman ships came under frequent attacks by the Knights, as they attempted to stop Ottoman expansion to the West. Not to be outdone, Ottoman ships struck many parts of southern Europe and around Italy, as part of their wider war with France against the Habsburgs. The situation finally came to a head when Suleiman, the victor at Rhodes in 1522 and at Djerba decided, in 1565, to destroy the Knight's base at Malta. The presence of the Ottoman fleet so close to the Papacy alarmed the Spanish, who began assembling first a small expeditionary force (that arrived in time for the siege) and then a larger fleet to relieve the Island. The ultra-modern star shaped fort of St Elmo was taken only with heavy casualties; the rest of the island was too much. Even so, Barbary piracy continued and the victory at Malta had no effect on Ottoman military strength in the Mediterranean. O'Shea points out that both sides made use of buccaneers during this period. The Knights from Malta raided Ottoman shipping; the Spanish raided North African ports while Muslim buccaneers gave measure for measure. Some of the best Muslim buccaneers were former Christians, he says. The death of Suleiman the Magnificent in 1566 brought Selim II to power. Known by some as "Selim the Sot," he assembled a massive expedition to take Cyprus from the Venetians, an Island far closer to Ottoman-controlled Middle East then to Venice. The other military option that Selim opted out of was to assist the Moorish rebellion that had been instigated by the Spanish crown to root out disloyal Moors. Had Suleiman succeeded in landing in the Iberian peninsula, he may have been cut off, for after he had captured Cyprus in 1571 he suffered a decisive naval defeat at Lepanto. The Holy League, assembled by the Pope to defend the Island arrived too late to save it (despite 11 months of resistance at Famagusta) but having collected so much of Europe's available military strength, sought to inflict a blow on the Ottomans, which with better supplied ammunition and armor, they did. The chance to retake Cyprus was wasted in the typical squabbling the followed the victory, so that when the Venetians signed a peace treaty with the Ottomans in 1573 they did so according to Ottoman terms. Of greater interest in Suleiman's reign is the emergence of Russia as a new Christian power in the north. Prior to the 1570s, Muscovy was a minor power that competed against the numerous Mongols, Turks and Tatars in the region, all of whom were predominantly Muslim. Since the Ottoman Empire had control of the southern portions of the Black Sea and the Crimean Khanate possessed the northern portions in the Crimea, they were natural allies. They also provided for the Ottomans a supply of slaves taken from Tatar raids into neighboring Christian Ukraine, most prominently that of Roxelana. Thus, when the insane Ivan the terrible successfully avenged years of defeat by sacking the city of Kazan in 1552, it was to the shock of the Ottoman Sultanate. The fall of Kazan had no immediate implications on the Empire of the Turks. Nonetheless, Russia's military power in the Crimea would only steadily increase, whilst those of the Turkish vassals—especially that of the Khanates fell. Too far and too preoccupied with events closer at home, Suleiman could do little to stop these events and his descendants would eventually find defeating the Russians an increasingly difficult task. Murad III's mismanagement may have led to early Ottoman defeats in the war, but he sired more than 100 children with 1,200 concubines. After Suleiman' death in 1566, Selim II posed less of a threat to Europe. Though Cyprus was captured at long last, the Ottomans failed against the Habsburgs at sea (see above Battle of Lepanto). Selim died not too long after, leaving his son Murad III. A hedonist and a total womanizer, Murad spent more time at his Harem than at the war front. Under such deteriorating circumstances, the Empire found itself at war with the Austrians yet again. In the early stages of the war, the military situation for the Ottomans worsened as the Principalities of Wallachia, Moldova, and Transylvania each had new rulers who renounced their vassalship to the Ottomans. At the Battle of Sisak, a group of Ghazis sent to raid the insubordinate lands in Croatia were thoroughly defeated by tough Imperial troops fresh from savage fighting in the Low countries. In response to this defeat, the Grand Vizier launched a large army of 13,000 Janissaries plus numerous European levies against the Christians. When the Janissaries rebelled against the Vizier's demands for a winter campaign, the Ottomans had captured little other than Veszperm. 1594 saw a more fruitful Ottoman response. An even larger army was assembled by the Grand Vizier Sinan Pasha. In the face of this threat, the Austrians abandoned a siege of Gran, a fortress that had fallen in Suleiman's career and then lost Raab. For the Austrians, their only comfort in the year came when the fortress of Komarno held out long enough against the Vizier's forces to retreat for the winter. Despite the previous years' success, situation for the Ottomans worsened yet again in 1595. A Christian coalition of the former vassal states along with Austrian troops recaptured Gran and marched southward down the Danube. They reached Edirne; no Christian army had set foot in the region since the days of the decadent Byzantine Empire. Alarmed by the success and proximity of the threat, the new Sultan Mehmed III strangled his 19 brothers to seize power and personally marched his army to the north west of Hungary to counter his enemies' moves. 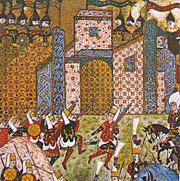 In 1596, Eger, the fortress that had defied Suleiman with its "Bull's blood" fell quickly to the Ottomans. At the decisive Battle of Keresztes, a slow Austrian response was wiped out by the Ottomans. Mehmet III's inexperience in ruling showed when he failed to award the Janissaries for their efforts in battle, rather he punished them for not fighting well enough, inciting a rebellion. On top of this, Keresztes was a battle that the Austrians had almost won, save for a collapse in discipline that gave the field to the Turks. Thus, what should have sealed the war in the favor of the Ottomans dragged on. Keresztes was a bloodbath for the Christian armies—thus it is surprising to note that the Austrians renewed the war against their enemies in the summer of 1597 with a drive southward, taking Papa, Tata, Raab, and Veszperm. Further Habsburg victories were achieved when a Turkish relief force was defeated at Grosswardien. Enraged by these defeats, the Turks replied with a more energetic response so that by 1605, after much wasted Austrian relief efforts and failed sieges on both sides, only Raab remained in the hands of the Austrians. In that year a pro-Turkish vassal prince was elected leader of Transylvania by the Hungarian nobles and the war came to a conclusion with the Peace of Zsitva-Torok (1606). This significant treaty involved the two emperors agreeing to regard each other as of equal status and their empire's as equally legitimate. Poland, a large Catholic kingdom bordering the Ottomans was a natural enemy of the Turkish Empire. Osman II raised the issue of Polish-sponsored Cossack raids with warfare. Though the Ottomans made their greatest European advance now, the Polish under Sigismund III drove the Ottomans southwards, defeating them decisively at the Battle of Khotyn (1621). Meanwhile, despite the Thirty Years War, the Ottomans failed to make progress against the Austrians, thanks to the Safavid intervention in the East, distracting the Ottomans to fight there instead. 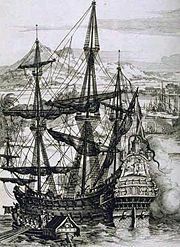 A Spanish Galleon. The Galleon was a tough fighting ship of its time. The Knights of Malta, emboldened by declining Turkish offensive power, began attacking Turkish ships in the Mediterranean. The Turks retaliated by besieging Candia on Crete in 1648. The Venetians were left to defend their last major Aegean island alone, as Austria was still recovering from the devastation of the Thirty Years War and Spain remained defiant against the French. Since the darker days for Venice of the 16th century, the Venetian fleet was a more potent force, defeating the Turks in their attempts to take the Island. So long as the Venetians had naval supremacy, the Ottomans could do little on land at Crete, and the blockade established by the Italian city state at the Dardanelles was more than a serious humiliation. Within 10 years the Spanish had signed a peace treaty with the French in 1659 and war with Austria resumed in the later 1660s. With the war going slow and the Austrians, Spanish, and Venetians operating with the initiative, the Grand Vizier seized power in the name of the Sultan and conducted a far more rigorous effort. Though beaten by the Austrians, the Ottomans concluded a favorable peace in 1664 and the Venetians were finally defeated at sea, ending the embarrassing blockade at the Dardanelles, so close to the Ottoman Capital. The Island fell after many years of siege, thanks to the skillful resources of the Grand Vizier, his organization of an army misused for many years and the French attacks on Austria, which forced her to postpone any offensives into Hungary. In 1663, the Ottomans launched a disastrous invasion of Austria, ending at the Battle of St Gotthard. The battle was won by the Christians, chiefly through the brave attack of 6,000 French troops led by La Feuillade and Coligny. The Austrians were unable to follow up on this victory due to the intervention of French forces in the Rhine; in such circumstances the Protestant allies of the Catholic Habsburgs would have proven unreliable, wanting instead to have the Austrians and themselves fight the French in a German coalition. The Ottomans therefore turned their attention north again against the Polish-Lithuanian Commonwealth. By now, the Kingdom had fallen into a terrible state; the Sejm had divided loyalties and the treasury was bankrupt. It is, therefore, noteworthy that Jan III Sobieski of the Poles led a decisive victory against the Ottomans at the Second battle of Khotyn. Restless, the Ottomans were to have another chance in 1682, when the Grand Vizier marched a massive army into Hungary and to Vienna in response to Habsburg raids into Ottoman controlled Hungary. In 1683, after 15 months of mobilizing forces, the Grand Vizier reached Vienna to find the city well defended and prepared. Worst of all for the Vizier were the numerous alliances established by the Austrians, including one with Jan Sobieski. When the siege of Vienna began in 1683, the Polish King and his coalition of Germans and Poles arrived just as the city's defense became untenable. In a decisive victory, the Ottomans were defeated, but not destroyed. Yet, more Christian squabbling had prevented the "liberation" of Hungary from years of Islamic vassalship. In 1687, the Ottomans repaired their armies and marched north once more. However, Duke Charles intercepted the Turks at the Second Battle of Mohacs and avenged the loss inflicted on the last Hungarian King over 260 years ago by Suleiman the Magnificent. Pressing southward, the Ottomans continued to resist the Austrians, denying them an opportunity to negotiate from a position of strength. Only when the Ottomans suffered yet another disastrous battle at the crossing at Zenta in 1697, did the Ottomans sue for peace; the resulting treaty of Karlowitz in 1699 secured vast amounts of the Balkans, including Hungary, for the Austrians. Throughout Europe, both Protestants and Catholics hailed Prince Eugene of Savoy as "the savior of Christendom"—English volunteers, including a son of Prince Rupert (nephew of Charles I of England) and Protestants from as far as Scotland fought in the Prince's army. For the Ottomans, the years between 1683 and 1702 were a sad time; 12 Grand Viziers were hired and deposed in 19 years—the legacy of what was at one time under Köprülü Mehmed Pasha the most powerful position of the most powerful Empire in the world. By war's end, the Austrians had decisively shifted the balance of power away from the Ottomans. Although the Great Turkish War was a disaster for the Ottomans, from which they were unable to recover, the Habsburgs were soon drawn into another destructive European War against the French, their traditional rivals. The King of Spain was childless and approaching death. The two most powerful claimants to the Spanish throne were the Austrian branch of the Habsburgs and the French Bourbon dynasty. The Protestant powers of England (later Great Britain) and the Netherlands were concerned with the consequences of either Catholic power seizing all the lands. When the French decided to inherit the entire Empire without partitioning it with the Austrians, war broke out lasting until 1714. By the time the war had ended, Eugene's reputation in battle had risen further with victories such as those at Blenheim. Nonetheless, France had succeeded in de facto annexing Spain by placing a member of the Bourbon on the throne. Even so, the Italian provinces of the Spanish crown passed to the Austrians, and the Catholic portions of the Low countries—rather than passing to the Dutch who coveted them, or to the French who desired them as part of their expansion of their borders, returned to Imperial control once more. With the war over, Eugene turned his attention south again. Another victory was added to his record at the battle of Petrovaradin, a stunning victory in which the cunning Prince saved his army from defeat at the hands of larger force and disease. However, Austria failed to produce a military commander worthy enough to succeed him. In the absence of such a talented leader, the Ottomans won a surprising victory against their Christian opponents at the Battle of Grocka. Drunken, outnumbered and in a disorderly fashion, the Ottomans had forced the overconfident Austrians to surrender. It was a shameful defeat, one of many in Empress Maria's reign, for which she was able to discipline her incompetent Generals. For the next 100 years, the Austrians and the Ottomans both began to slowly lose their power to the French, British, Germans, and Russians. The key problem faced by both Empires was the rise of a new era; industrialization. New industries in Germany, France and Britain produced massive quantities of manufactured goods that aided in war and diplomacy. Both the British and the French had colonial empires that fueled their economies with raw materials, whilst the Germans found what they needed in the Ruhr valley. Although the Russians had no such colonial empire, they did have vast amounts of territory and manpower. Both the Ottomans and the Austrian lacked heavy industries in the same level as their other European counterparts, but the former was far behind the latter. Thus, Ottoman power decayed faster than Austrian power. In the Balkans, the cries for independence became increasingly frequent a bigger problem for the more militarily incompetent Ottomans. (Initially technological very competent, the Ottomans grew complacent and failed to keep up-to-date.) After 1867, the Austrians compromised with the Hungarians to form Austria-Hungary, thus eliminating a major ethnic group from rebelling in the shorter term. The same benefits could not be had with the Ottomans. Efforts to catch up with Europe in technology demanded officers and intellectuals to study abroad—a plan that backfired for the Ottomans when these individuals brought back European ideas of Enlightenment and equality, which clashed with the Turkish-dominated, autocratic, millet system of the Ottomans. Therefore, Ottoman power collapsed more rapidly than Austrian power, and they were powerless to stop Bosnia from being annexed by the Austrians in 1878. Had it not been for the Western powers of Britain, France and Prussia, the Ottomans would have faced more defeats against the Austrians and their newer enemies, the Russians. In 1878, when European powers met in Berlin to settle what they saw as the Ottoman problem, namely, that the Empire was hugely indebted to them, one result was ceding Bosnia to Austria-Hungary. While an international commission was entrusted with oversight of Ottoman finances, most of its territory remained intact. The exceptions were: Cyprus, which was ceded to Britain to help her look after her interests in the Suez; Serbia, Montenegro, and Bulgaria which were granted independence; and Bosnia which went to Austria-Hungary as a type of protectorate, since they had missed out on the European scramble for Empire. In 1909, Austria-Hungary formally annexed the province. Relations between Austria and the Ottomans began to improve when they saw a common threat in Russia and a common ally in Germany in countering the threat of the Tsar. The Ottomans had hoped that the Germans would industrialize their nation to defend itself against the Russians, who had taken the "anti-Turk crusade" to a more committed level, driving the Turks out of the Crimea and Caucasus. Meanwhile, the German Empire of Prussia appealed to the Austrians through a common culture, language and the lenient terms imposed after the Austro-Prussian War. The Austrians were in no hurry to see Russia advance at the cost of the Ottomans towards their borders. Thus, in the years before World War I, the two former enemies found themselves allies against the French, the Russians and the British. Both powers proved to be incapable of arming their troops with enough firepower and feeding their populations under blockade. In 1918, the Austro-Hungarian Empire surrendered to partition under the Treaty of Saint-Germain, as did the Ottomans under the Treaty of Sèvres. The victors of World War I then carved most of the Ottoman space up between themselves, according to an agreement they had made before the war had even ended. These territories became mandates under the newly formed League of Nations. Mustafa Kemal Atatürk, by distancing the Turkish people from the Ottoman government, then managed to avoid the imposition of punitive reparations on Turkey, founding the modern nation-state of that name. The border was patrolled and fortified. By common agreements, minor infringements were ignored. The Ottomans constructed forts "built of stone-faced earth." During war, these forts often changed hands. Janissaries manned the forts but when needed, additional soldiers were conscripted locally. These men also received a stipend. While the conscripts were Muslim, Christians also performed garrison duty from the late fifteenth century in return for certain tax exceptions. The centuries of conflict between the Ottomans and Europe has often been characterized as a civilizational clash. The eventual achievement of sovereignty by all former Ottoman territories in Europe, and the birth of nations based on ancient entities such as the Serbian Empire and the Bulgarian Empire in the nineteenth century, can be regarded as a victory for European civilization, itself often identified as Christian. European writing habitually depicted the Turks as barbaric destroyers of culture who oppressed their non-Muslim populations for hundreds of years. O'Shea suggests a somewhat different narrative. Between the epochal battles, he says, were moments, even eras, of convivencia. People passed over the border and back again as traders, "scholars, translators, merchants and clerics." Some "wandered about the world" contributing "to its halcyon moments of cultural exchange." "Convivencia," he says, as a "continuum of cooperation" was "audible as a kind of ground tone upon which the more martial music of narrative history must be played,." This "informed the entire medieval millennium," he says, "even those epochs that opened or closed with battle." "By combing the epochal battles with the eras of convivencia," says O'Shea, "a clearer picture of the complex encounter of Christianity and Islam emerges." Others point out that when Jews fled from persecution elsewhere, usually in the Christian world, they found refuge in the Ottoman Empire. Many settled in the Balkans. Some men were admired on both sides of the frontier. Hayreddin Barbarossa, for example, was invited by Holy Roman Emperor Charles V to cross sides. He was offered the rank of Habsburg Admiral-in-Chief with the governorship of the empire's North African colonies. Although he refused, this incident shows that that attitudes towards the "Other" were more complex than accounts tend to suggest. Mulei Hassan appealed to Charles for help in 1534 and was restored to his throne but as a Christian vassal. He did not hesitate to seek Habsburg aid against Suleiman's chief Admiral. The two sides also entered truces, such as that between Charles V and Suleiman in 1544, treaty in 1568, another in 1573, the peace of 1606 which ended the Thirteen Years' War and the peace of 1664. ↑ Turnbull. 2003. page 50. ↑ Luther and Schultz (1967), 177. ↑ Luther and Schultz (1967), 170. ↑ Luther and Schultz (1967), 184. ↑ I earn, Count Miklós Zrínyi,the Poet-Warlord. Retrieved November 24, 2008. ↑ Shaw and Shaw (1976), 128. Faroqhi, Suraiya. 2004. The Ottoman Empire and the World Around It. London, UK: I.B. Tauris. ISBN 9781850437154. Finkel, Caroline. 2006. Osman's Dream: The Story of the Ottoman Empire, 1300-1923. New York, NY: Basic Books. ISBN 9780465023967. Goffman, Daniel. 2002. The Ottoman Empire and Early Modern Europe. New approaches to European history, 24. Cambridge, UK: Cambridge University Press. ISBN 9780521452809. Luther, Martin, and Robert C. Schultz. 1967. "On War Against the Turks." Luther's Works. Volume 46 (American Edition). Philadelphia, PA: Fortress Press. ISBN 9780800603465. Shaw, Stanford J., and Ezel Kural Shaw. 1976. History of the Ottoman Empire and Modern Turkey. Cambridge, UK: Cambridge University Press. ISBN 9780521212809. Stein, Mark L. 2007. Guarding the Frontier: Ottoman Border Forts and Garrisons in Europe. London, UK: Tauris Academic Studies. ISBN 9781845113018. Szalontay, Tibor. 2006. The Art of War During the Ottoman-Habsburg Long War, 1593-1606, According to Narrative Sources. Ottawa, CA: Library and Archives Canada = Bibliothèque et Archives Canada. ISBN 9780494026380. Turnbull, Stephen R. 2003. The Ottoman Empire, 1326-1699. Essential histories. New York, NY: Routledge. ISBN 9780415969130. This page was last modified on 11 December 2008, at 17:55.